Remembering our High School chemistry classes, we understand that everything we come in contact with is a chemical, except for light and electricity. We are exposed to chemicals when we bathe, shampoo our hair, use cleaning solutions, laundry detergent, nail products and a host of other items we use every day. (A newborn baby’s skin is 100% chemical.) These chemicals are in no way harmful as long as we follow the safe directions and instructions for use and read and understand the warning labels. Learning how to identify and prevent overexposure to nail chemicals for our clients and ourselves should be a top priority. Overexposure that results in allergic reaction can be prevented. It all starts with paying specific attention to our preparation, application and finishing techniques, knowing our products and using ventilation in the salon. Nail technicians and their clients are exposed to a wide variety of potential allergens in the salon. We wipe our monomer soaked brushes on the table towel and then rest our arms in the same spot. We use our fingers or our wet brush to clean off any product that has over-run the clients cuticle or sidewall lines. We allow nail dust to collect on the skin of our hands and arms, while our arms rest on a wet, dusty table towel. We use drills at higher than recommended speeds which can throw the nail dust in our faces and into our breathing zone. If we wear masks to protect ourselves from vapors or dusts, we rarely change them, or we wear the wrong type mask. These practices, among others, can cause overexposure to potentially harmful chemicals which will result in sensitivity and allergic reaction. Allergic Contact Dermatitis develops in stages — it does not happen overnight. There is a period during which an individual may be continually in contact with an allergen without developing any skin reaction, which can last a lifetime or only a few days. The allergenic action of a substance depends on its ability to change some properties of the outer layer of the skin. This layer acts as a protective barrier against toxic substances. Some substances, such as primer, can remove fats and oils. Other substances, such as prep, polish remover and other solvents, can remove moisture from the skin. These substances diminish the protective action of the skin and make it easier for substances to penetrate the skin. The skin allergy really begins with a process called sensitization. It starts with the penetration of allergenic substances into the outer layer of the skin. The process lasts from four days to three weeks; during this period there are no signs of skin damage. Once penetrated, the allergenic substance combines with the natural skin proteins which is then carried throughout the body by white blood cells called lymphocytes. Lymphocytes are part of the immune system which guards the body against germ or alien substances. The immune system has a ‘memory’ to recognize and neutralize germs or substances encountered more than once. When sensitized persons are re-exposed, lymphocytes recognize the allergen and react with it. They also release tissue-damaging chemicals called lymphokines which cause itching, pain, redness, swelling, and the formation of small wheals or blisters on the skin. This inflammation is usually confined to the site of contact, but in severe cases it may spread to cover large areas of the body. The reaction usually starts within twelve hours of exposure and is at its worst after three to four days, and slowly improves in about seven days. The allergic sensitization may remain with the individual through life, although if there is no further contact with the allergen, the level of sensitivity may gradually decline. Irritant Contact Dermatitis can develop after a short, heavy exposure or a repeated or prolonged low exposure to a substance. The appearance of irritant contact dermatitis varies considerably according to the conditions of exposure. For example, an accidental contact with a strong irritant causes immediate blisters. Contact with a mild irritant may only produce redness of the skin. However, if the irritation continues, small lesions or sores appear on the reddened area; afterward, crusts and scales form. The skin damage usually heals a few weeks after exposure ends if no complications have arisen (no infections occurred). To produce the damage, the irritant substance must infiltrate the outer layer of skin where it will come into contact with cells and tissues. The substance also reacts with certain chemicals naturally present (endogenous) in cells and tissues. These reactions produce skin damage. The body’s first reaction to the damage is localized acute inflammation. The cells and tissues try to repair the damage and set up a defensive response to remove the invading material causing the damage. During the body’s defensive response phase, a person may experience pain, warmth, redness and swelling in the irritated area. Minimal skin damage, as in thickening of the inner layer of the skin, will not be visible. However, when the damage is severe, the skin shows signs of chapping, scaling, and blistering and some skin cells also die. Typically, an irritant reaction develops within a few hours from exposure and is at its worst after approximately 24 hours. This photograph is of a client that has experienced a severe allergic reaction to acrylics. Note the dry, red, peeling skin around the cuticle and sidewall lines. The lifted nail plate will grow forward as new cells replace the old. The chemical properties of the substance (for example, is it an acid, an alkali, or a salt). The amount and concentration of chemical coming into contact with the skin. The length and frequency of the exposure. It is this type of allergic reaction that is most evident in nail technicians and their clients. The Above Information Contributed by: Canadian Centre for Occupational Health & Safety. What can we do to prevent overexposure and allergic reaction? Never touch the brush hairs with your fingers, or allow the brush to touch the clients skin. Never apply product too wet or allow the wet brush to touch the prepared nail plate. Use disposable towels when wiping your brush, and discard them after use and before filing. Leave a tiny margin all around the cuticle and sidewall lines free of product. This will prevent overexposure and allow for air-tight retention of product to the nail plate. Wear a long-sleeved smock to prevent dusts from settling on your skin. Wear a mask specifically designed for dusts when filing, and change it often. Install a local exhaust ventilation system to rid your salon of potentially harmful vapors. Use dispenser bottles that have small openings only large enough for the brush to enter. Monomer soaked pads should be placed in a sealed bag before being placed in the trashcan. Monomer soaked or dust laden towels should be removed from the table top and laundered separately from other salon laundry. Trashcan liners should be changed daily. Never pour more liquid into your dappen dish than is needed for the type of application you are performing. Wear protective glasses to prevent dusts or flying debris from entering and damaging your eyes. Never smoke, eat or drink at the nail table. Vapors and dust can settle on your food or in your drink, and the ‘flick of a Bic’ can cause a spark that can ignite flammable airborne vapors. Always keep MSDS on all products used in your salon. Read and follow the product manufacturers application instructions and the warning labels on your products. Store nail chemicals in a cool, dark place and away from sources of heat or flame. Store nail chemicals in a separate location from hair chemicals – the vapors of some of these products are not compatible with each other, and can often create a undesirable and potentially hazardous chemical reaction. For a more detailed explanation of overexposure and allergic reactions to nail chemicals, please read: Nail Anatomy and Product Chemistry by Douglas D. Schoon available through Milady Publishing. Once again Doug Schoon has come to my aid by providing me with this excellent Tech Note on How to Avoid Skin Allergies. His comments are mainly on Artificial Nail Products; however, we can use this information in all aspects of our ‘chemical’ lives. In order to pay homage to Doug in the correct manner, I am re-printing the information verbatim. Avoiding Skin Allergies – It’s Easy to Do! Allergic reactions to many types of cosmetics may occur when the skin is repeatedly exposed to small amounts of allergy causing ingredients. Dermatologists have a special name for allergy causing substances; they are called allergens. For example, pollen is a common allergen. In fact, most allergens are natural substances, (i.e. poison ivy, ragweed). Some ingredients used in cosmetics may also be allergens. Usually these ingredients are beneficial for the vast majority of people. However, just as there are people sensitive to pollens, some people are sensitive to cosmetic ingredients. Of course, the great majority never experience any problems. But, a smaller number of people may develop skin allergies when exposed over a period of time. Allergic skin reactions usually occur after several months (or years) of exposure to the ingredient’s). It is important to understand that cosmetic related skin allergies usually don’t happen right away. Fragrance ingredients are the most common cosmetic allergens. In fact, sensitivity to preservatives (necessary for proper shelf-life) and fragrances account for most cosmetic-related skin allergies. Of course, other types of ingredients may also cause sensitive clients to develop symptoms such as redness, itching or other signs of irritation. Simple irritations usually reverse themselves when exposure is discontinued. However, symptoms may worsen with repeated exposure or could develop into skin allergies. Once skin develops an allergic sensitivity to an ingredient, the allergy will be permanent! When the skin’s immune system recognizes an ingredient as an allergen, it never forgets and will always react negatively upon exposure. Clearly, all nail professionals should understand the importance of avoiding product overexposure. Skin allergies can occur with any type of artificial nail enhancement. Often, the allergy begins as a slight itch or reddish area, or a spot that feels ‘warm’. If the facial area is touched with contaminated fingers, the skin might become irritated near the chin or around the eyes. On the fingernails, if ignored and overexposure continues, these symptoms can become an annoying itch of the nail beds or water blisters around the cuticle area, sidewalls or fingertips. If ignored still, the symptoms might spread to hand or wrist. Luckily, all of this is easy to avoid – if you understand your products and use them wisely. Which type of enhancement products can cause skin allergies? All of them can! But “can” is different than “will” — in most cases, these allergies can be avoided and the nail professional is the key! UV gels, liquid monomers, wraps and tip adhesives share several ingredients capable of causing skin allergies. What’s the reason for these skin reactions? In a nutshell, the culprit is overexposure caused by prolonged or repeated skin contact and usually many months, sometimes years of exposure. For instance, a sticky, water-resistant product remaining on the skin for long periods may lead to overexposure via prolonged contact. Or, constantly touching uncured gel or liquid monomers on a brush handle may create overexposure by repeated contact. Touching the brush flags to the soft tissue of the eponychium, sidewalls or under the free edge are common ways of overexposing clients. No matter which type of enhancement product is used, each shares the same general requirement – they must be cured properly if they are to be used safely. In short, skin contact must be avoided with uncured gels, monomers, resins and adhesives. Below are a few of the main reasons enhancement-related skin allergies occur and some useful tips for avoiding them. Cause #1: UV gels are usually very sticky, adhering tenaciously to brush handles, tabletops and containers. This can make it more difficult to avoid prolonged and repeated contact. Also, UV light is required to harden the gel. The various types of bulbs (used in UV lights) quickly begin to emit less and less UV light. After a while, they don’t produce enough UV light to properly cure the product. After 3-6 months (depending on your usage) these bulbs emit less than half the UV light of a new bulb – even though the bulbs continue to emit UV visible blue light. This often fools nail professionals. UV light is invisible, so you cannot see when the intensity is lower. Inexpensive UV bulbs (often with lower quality) may save a little money, but will leave uncured (un-reacted) ingredients in the product. On the other hand, some gels heat us excessively, causing the client to jerk their hand from the light. Shortening the time under the light produces the same effect as using old UV bulbs – incomplete and improper cure of the enhancement. What’s the result of incomplete cure? Un-reacted ingredients can be left inside the enhancement. These are ingredients that normally would react and become a permanent part of the artificial nail. Un-reacted ingredients are usually fairly mobile. In other words, they can migrate through both the artificial and natural nail, until reaching the soft, living tissues of the nail bed. Such allergies often cause clients to complain about “itchy” or “warm” nail beds. Finally, it is very important to avoid soft tissue contact with the gooey surface layer. This layer of ‘goo’ is caused by the affect of air on curing the gel. the air above the gel prevents the product from properly curing on the surface. This annoying phenomenon is made worse by weak or old UV bulbs. This gooey layer contains un-reacted ingredients which can cause skin problems, so always avoid skin contact. Alcohol or other solvents used to wipe away this layer carry the allergens to your fingers through the cotton or pad, increasing the potential for skin overexposure. Prevention: Avoid skin contact and keep implements and containers clean. Keep table area free of UV gel and dusts. Be especially careful to avoid contact with the gooey surface roll-off. It is best to use a plastic backed pad to prevent product ingredients from soaking through to the skin. Avoid laying your arm(s) in the dusts or where you wipe your brush. Freshly hardened dusts still contain small amounts of un-reacted ingredients. Use only high quality UV bulbs from a reputable source and replace them often – especially if used every day. Clean the bulbs daily to prevent dusts and/or product build-up. Apply thinner layers of gel to prevent excessive heat (exotherm). Thinner layers will allow the product to cure more completely. Don’t shortcut the recommended time client’s hands are in the UV light and make sure they are positioned correctly by following the instructions provided with the unit. Cause #2: Overexposure to monomer liquids can cause skin allergy as well. Odorless products are more likely to cause client sensitivities than the traditional, odor-based enhancement products. Odorless products must be used with a dry bead consistency, but are often used with too wet a mix ratio. As with all liquid/powder systems, the ratio of monomer (liquid) to polymer (powder) must be correct. A medium consistency (slightly on the dry side) is best. Avoid using enhancement products with a wet mix ratio. the powder carries an ingredient needed to completely cure the enhancement. Using too little powder (equals working wet) will leave un-reacted ingredients inside the enhancement. Different companies use varying amounts of curing agents in their powders, so only use powders that are specifically designed for that monomer liquid. If you don’t, your mix ratio will be out of balance. As with UV gels, un-reacted ingredients can migrate to the nail bed and cause itching. Allergic skin reactions, i.e. ‘water blisters’ around the nail plate area can result if brush flags touch the skin repeatedly. Skin contact can also occur while ‘cleaning up’ around the sidewalls or under the free edge with the wet brush. Prevention: As with UV gels, keep brush flags off the soft tissue to avoid transferring monomer liquid to the skin. Leave a tiny margin between the product and the eponychium and sidewalls. Ensure you are always using the proper mix ratio – never wet! Don’t use a brush soaked with monomer to smooth the enhancement. Always use the correct powder with the monomer liquid. Keep your table free of dusts and avoid laying your arms on the towel where you wipe your brush. No matter what you use, all nail professionals should wash their hands after each client. Also, always use a moisturizer to ensure hands are properly conditioned. Wraps and Glues: These contain ingredients found in other types of systems, so they can cause skin allergies (as well). Even so, they are much less likely to cause allergies and very few clients develop sensitivities to them. Why? Mainly, because they react almost instantly in the presence of moisture, so only trace amounts of un-reacted ingredients remain. Simply avoiding repeated direct skin contact is enough to avoid overexposure. Glues are frequently the first product that is suspected when clients complain of itchy nail beds, but they are seldom to blame. Remember: Avoid over-filing the nail plate. The top layers are composed of very hard cells designed to protect and seal the underlying layers. If filed away with too aggressive of a technique, the nail plate becomes more susceptible to penetration by un-reacted ingredients. So, keep the plate thick and healthy! that’s every nail professional’s most important job. Skin allergy is possible with many types of cosmetic products. Luckily, allergies to nail enhancement products are easy to avoid. But, you must have the correct information and understand how to properly apply your knowledge. If you understand the causes, you will be able to avoid product related skin allergies. The key is to reduce product exposure to safe levels by avoiding skin contact. Client allergies to nail enhancement products usually take many months to develop, so there are many chances to prevent skin contact. Nail professionals must also take care to avoid overexposing themselves and becoming sensitive. In short, avoid prolonged and/or repeated contact to all nail related products, while always using them safely and wisely. That’s the best way to ensure that your clients will love their nails. Switching from one product line/type of nail product to another will not alleviate skin allergy symptoms. 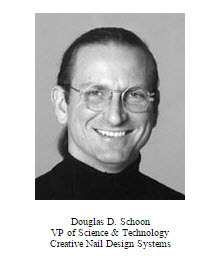 According to Doug Schoon, all artificial nail related products ‘share’ many of the same chemicals. Once allergic, we are allergic for life, so the best way to alleviate the problem of skin related allergic reaction, is to soak off the enhancements in an approved remover, perform a natural nail manicure, and prescribe a Nail Toughener (such as Toughen Up by Creative Nail Design) that will help to give the nail plate more strength by adding additional cross-linking molecules to the nail plate until it grows out on its own. Also, twice daily applications of Solar Oil will help to keep the natural nail plate flexible and strong as it grows. A conditioning treatment that penetrates deeply and quickly, softening cuticles and promoting strong, flexible natural nails and enhancements. SolarOil’s natural blend of Jojoba Oil, Sweet Almond Oil and Vitamin E creates a light, penetrating oil with antioxidant agents. Solar Oil is available in 1/8 fl. oz, 1/2 fl oz or in larger sizes to professionals through ‘Professional Only’ distributors, and to clients through their local Nail Salons. At some point, a client may wish to have the enhancements removed. There is a quick and safe way to remove nails without damage to the natural nail. There are many ways to do this, and we will cover the main techniques; however, we much prefer the first method. A common myth is that enhancements should be taken off every few months to let the nail plate ‘breathe’. There is no scientific evidence to support this notion. Nail plates do not require time to breathe, nor are they capable of breathing. Each time product is removed and reapplied, the underlying nail plate becomes thinner and weaker. This is especially true when the enhancement is picked or pried from the nail plate. Improper removal is a crime against the client’s nails. It is a major reason for natural nail damage as these are not gentle techniques. Each of these techniques will rip up layers of natural nail plate. You must take your time or the client’s nails will suffer the consequences. Cross-linking makes enhancements more resistant to solvents in nail polish and polish removers. Unfortunately, it also makes product removal more difficult. Only uncross-linked polymers dissolve in solvents. Cross-links prevent the enhancements from dissolving. Then, how is the product removed? The solvent swells the polymer network until it breaks into chunks. The same effect is seen when a roll of paper towels is put into a bucket of water. It will break up even faster if you poke it with a stick. The enhancement will also swell more quickly if the solvent is slightly warm. Warming the solvent can cut product removal time in half. Remove all traces of nail enamel, and remove any surface shine with a 240-grit file. Pre-filing the surface will allow the remover to quickly penetrate the molecular structure of the enhancement. Ask the client to remove all jewelry from wrists and fingers. Fill the Quick Soak bowl with hot tap water to the fill line. Squeeze the bottle to remove excess air and tightly seal the cap. Pour enough remover into the fingerbowls to cover the nails. Drop a few marbles into each fingerbowl to give the client something to ‘play’ with while her nails are soaking. Make sure the entire nail or nails are covered with the solution. Cover the hand and dish with a terry towel and soak for 15 to 30 minutes. Do not lift the nails out of the remover for the entire time. Lifting the nails from the remover will allow the nail product to ‘set-up’ again, and will extend the removal time. Covering the hands and dish with a terry towel will help to prevent rapid evaporation of the remover, and prevent any warmth from escaping. Lift the towel off and with the nails still submerged, lightly layer the product from the nails with a cuticle pusher. Gradually remove all product from the natural nail. After all product has been removed, lift the hands from the remover and wipe the hands and nails with a towel. Buff any remaining product from the nails with the fine side of a Koala Buffer™ (Creative Nail Design Systems). You may wish to ask the client to wash her hands and scrub her nails with a soft nail brush or toothbrush. Do not vigorously scrub the nails at this point. Condition the nails and skin with oil, then massage the entire hand with lotion. Wash hands and nails to remove lotion and oils, apply the service (reapply product, or polish the nails). Prescribe a home care program that will continue the health and beauty of the new service. Retail the recommended home care products to your client, and book her next appointment. NOTE: Please be aware that the manufacturer of these specific bowls may no longer be in business. If you like this method, you may also warm the mixture in a ‘bowl-within-a-bowl’. To do this, put some flat marbles in a medium size dish and fill part way with hot water. Place a smaller dish filled with acetone into the hot water filled dish. The results will be the same. Sometimes a client may prefer not to sit in one place while having her nails removed, or there may not be a designated area in your salon for product removal. In either case, try this ‘wrap’ removal method. Remove all traces of enamel and buff the enhancement surface with a 240-grit file to prepare the product for removal. Loosen the cap on the bottle of remover and hold the bottle under warm tap water for a minute or two, but no more than 5 minutes. Saturate a cotton pad, cotton ball, or gauze pad with remover, and place on the surface of the enhancement. Seal the cotton pad by tightly encasing it in a square of tin foil. Apply each pad and foil seal individually to prevent evaporation of the remover. Soak in this manner for 20 to 30 minutes. Remove one ‘wrap’ to check for progress, and lightly slough the product from the nail surface with a cuticle pusher or orangewood stick. After all product has been removed, buff the nail surface with the fine side of a Koala Buffer™ to ensure all product has been successfully removed. Condition the skin and nails with oil and massage entire hand with lotion. There is no set time period for complete product removal. The length of time depends entirely on the type of product; i.e., acrylic, wraps or gels, and the thickness of the material. The thicker the product, the longer the client will have to soak. Most gel products are difficult to remove because they are highly cross-linked and resistant to many solvents. Usually, the product must be filed from the nail plate. This can damage the plate and underlying bed if not performed with care. The heavy consistency often causes gel users to apply the product too thickly. This creates unnatural and unsightly enhancements and makes removal very difficult. Gel enhancements should only be removed when it is absolutely necessary as gel removal is a time-consuming process. Slowly file (not drill) the enhancement with a medium-grit file, leaving a very thin layer of product. Do not file all the way to the natural nail plate. Soak in warm product remover. Once softened, scrape the remaining product from the nail plate with an orangewood stick. Never warm a solvent with an open flame, stove, microwave, blow dryer, or other similar devices. Solvents should be warmed with extreme care! Most are highly flammable. Warm only enough solvent to do the job. Take care to avoid any open flames, sparks, or other sources of ignition, (i.e., cigarettes and cigarette lighters.) Warm solvents and their vapors are even more flammable! The success of any nail enhancement service is shared between the nail technician and the client. The nail technician is 50% responsible in diagnosing the clients nail needs by performing a consultation to determine her/his lifestyle, activity level and nail plate shape, prescribing the proper service and recommending home care products and procedures. The client is 50% responsible for following the recommended home care procedures, setting timely maintenance appointments, and following any other written or verbal instructions from the technician. This form was designed as a hand-out for all new clients, whether the appointment was for a full set or a first time maintenance appointment. Please feel free to print this page as a guide for your clients and customers. In order to maintain your Nail Enhancements for long-term wearability, please read and follow these simple guidelines. Oil nails twice per day to maintain inherent flexibility. Product that is allowed to become brittle will crack and break. There are several manufacturers products that I would recommend; however, since we all have our own personal choices, I will only recommend that the oil you use or sell contain Jojoba and Vitamin E oils. Jojoba oil has a very tiny molecule which is small enough to penetrate the surface layer of the skin and pull the larger molecule of the Vitamin E in behind it. Oils in addition to these are generally added to condition and moisturize the skin and nails. Applying oil to the nail enhancement will help to maintain flexibility by lubricating the product molecules. Applying oil to the natural nail free edge will help prevent ‘curling away’ and to maintain proper levels in the natural nail plate. Repetitive or severe pressure on the nail extension will lead to cracks that result in full-blown breaks. Treat your nails as jewels, not tools! The use of ‘tools’ to help you perform your daily routines will help to insure against breakage. For instance, use a pop-top opener to open soda cans, use the side of your hand or finger to open car or refrigerator doors, and never reach for anything with your fingertips as the nail extensions will reach the object first. Nails that are too long for your lifestyle and activity level (repetitive downward tip pressure) result in service breakdown. If your nails become too long between appointments, shorten the length with the 240-grit file. The higher the activity level, the shorter the enhancement should be. An active length = 1/4 the length of the nail bed. An average length = 1/2 the length of the nail bed, and a full fashion length equals the length of the nail bed. Extensions longer than the length of the foundation (the nail bed) will cause undue downward pressure with normal use of the hands and fingers which may result in a broken or torn natural nail plate. Properly applied product will shrink when cured and create an airtight seal. Mechanical forcing of product through extreme pressure, picking or nipping rough edges will result in lifting. Use a 240- grit file to remove rough edges or blend any lifting into the natural nail plate. Holding the file flat to the area of lift, gently file in the direction of the lifted material until the area of lift is removed. Do not over-file! Over-filing removes vital nail plate layers and will weaken the natural nail foundation. To re-seal the product, massage a drop of oil into the nail surface, then buff to a dull shine with the 360-grit buffer. You may also choose to buff to a high shine with a 3-way buffer. When changing polish between maintenance appointments, remove polish with regular polish remover and a lint free cotton or gauze wipe. I have never recommended the use of non-acetone polish remover as it requires more time to soften polish, thereby remaining on the product surface, softening and weakening the surface layer. After the enamel has been removed, wash hands and scrub nails with a soft toothbrush. Apply cuticle oil to the product surface and massage into the cuticles and overlay. Using the 360-buffer, buff the oil into the nail surface to re-seal the product. Buff to a high shine with a 3-way buffer or apply one thin coat of base coat, two thin coats of enamel and a thin application of topcoat, allowing the layers to dry between coatings. Fungus infections (Greenies) are caused by air-borne spores (pseudomonas bacterium) that have become trapped between the overlay and the nail plate layers. These spores require food to eat and moisture to grow. The nail plate layers contain contaminates along with the natural oil and moisture. Should any lifting occur between visits, buff away the area of lift. Do not attempt to glue the area of lift. Most instant glues are not moisture resistant. Instant glue also sets-up the instant it is exposed to air. The glue cannot ‘re-seal’ lifted material and may incorporate air-borne bacteria or spores into the area of lift. The bacteria or spores will be trapped between the nail plate and the overlay, utilizing the natural nail contaminates as food and the moisture to grow. The results are a greenish to brownish stain on the nail plate which is a by-product of the infection. Should any area of lift be too large to remove by filing, or visible discoloration is present, please call for a nail repair appointment. To prevent the spread of communicable or infectious disease, never share your files or implements with others, whether at home or in the salon. Your personal implements can be purchased through several different outlets: An ‘over-the-counter’ beauty supply, drug or department stores or from your salon. If your salon does not supply individual files for individual clients, ask to purchase these files and keep them in a clean, dry storage container between uses. Sanitize files and implements after every use in an approved sanitizing solution, rinse well, dry and store in the container. Wear gloves when performing household chores, working in the garden or whenever you use cleaning solutions of any kind. Most household cleaning solutions contain chemicals that will effect the overlay and result in service breakdown. Some household pest sprays contain a chemical that may actually melt the surface of the overlay and compromise the integrity of the product. Building a successful career requires hard work, dedication to perfection, continuing education, and a solid business plan. Many skilled technicians have failed to reach their goals because of other business factors not taken into account. Where do you want to start, and where do you want to be in 1, 5 or even 10 years? Do you wish to be a salon owner, a manufacturer’s educator, or the President of your own corporation? How do you plan to reach these goals? It is never too late to form a good solid business plan to guarantee your financial future. Let’s explore a few possibilities. The most successful people I know do not consider wearing blue jeans and T-shirts in the workplace as appropriate dress. Yet, this seems to be the attire of choice in many of the salons I have visited. Why? It’s comfortable! As nail technicians, we sit all day long; therefore, wearing comfortable clothing is a top priority. The most comfortable jeans I found for long hours of sitting are Levi’s ‘Red Tag’ Loose fit. I still wear them – though I no longer wear them to work. The clientele I wished to solicit and service were all professional executives. I could no longer put my comfort before my appearance because I quickly learned that playing the success ‘game’ meant dressing the part. These clients had money to spend, and did not mind spending it on looking good. They never appeared for appointments wearing anything other than professional clothing. This is not to say that I did not have clients who were casual dressers, because I did. However, my ‘jeans’ clients were either homemakers, or in a profession that required casual clothing. The term, “Professional Clothing” does not necessarily mean expensive suits or fancy dresses. 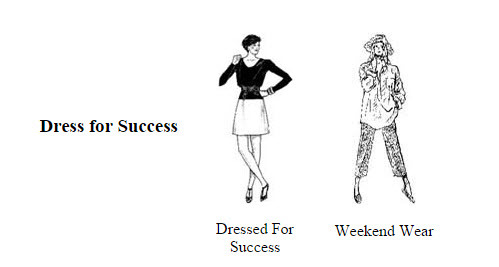 It does, however, rule out jeans, T-shirts, shorts, or any other casual attire best suited for weekend wear. What to wear to work? Opt to replace jeans with ‘Chino’ type slacks that offer the same level of wearability and comfort. You will find the cost factor to be comparable. If you like to wear shorts, which are understandably cooler during the heat of the summer, try replacing this casual look with a cool cotton skirt combined with a simple shirt. You might even enjoy wearing a simple dress that is cool and comfortable, yet easy to wear. Clothing that requires dry cleaning is not cost effective due to cleaning rates that make this type of material high-maintenance. When I changed my wardrobe from weekend casual to cool chic, I not only increased my confidence and self-esteem, but my clients were more receptive to my professional recommendations and bi-yearly cost of service increases. Just by altering my wardrobe, I exhibited the same type of professionalism as the clientele I sought to service. Developing a professional look and adopting a professional manner will aid in increasing your client base. Communication creates a bond between the service provider and client. Recognizing the client and calling her by name is the first link in creating a ‘feel good’ service atmosphere, and a long-term relationship. Acknowledge their presence within 60 seconds of their arrival in your salon. Should she be a new client, this is the available time frame in which to create an instant and positive impression. If you have a client information or consultation form, ask her to fill it out completely, then state that you will be with her shortly. Offer her something to drink, or direct her to the reading material, making her waiting time as pleasant as possible. Building and maintaining a strong client base involves developing a solid ‘consumer relations attitude.’ There have been many times I have gone into salons to detail nail products, and not had anyone greet me. If I found a receptionist at the desk, I was usually greeted with a blank stare while she waited for me to state my reason for being there. If I had been a potential new client, I would not have felt very welcome. A person has about 60 seconds to make an impression before an opinion is formed. You are assessed in your actions, or lack of action, on your education, economic status, and even your intelligence, before the person will decide to do business with you. This is determined by the way you look and talk in that first crucial minute. The most direct line of communication to prospective customers is the telephone. In many instances, the telephone is the consumer’s first impression of you and your salon. How you answer the phone, direct the conversation, or book the appointments are all a reflection of who you are, and is the deciding factor on whether an appointment is made. When I was educating, we took a video of ourselves making a presentation. Since I am from the South where strong accents are very evident, I had never paid much attention to the sound of my voice because I sounded like everyone else. I got the shock of my life when I not only heard what I sounded like to others, but also witnessed my body language. I either had my hands jammed to the depths of my jacket pockets, or was waving them around in the air, and I sounded like ‘Annie from the Country’. Jeff Foxworthy had nothing on me — I had ‘Redneck’ written all over me! I began to carry a small recorder with me in my car, and would recite my grocery list, list of errands, or recite some of my favorite family stories. I would listen to the tape, then start over with a new tape and repeat the same speech. Then I would compare the two tapes to hear my progress. I also set up my camcorder and filmed myself telling the same stories, then would play them back. I did this for a long time until I was satisfied with the results, and my new sound became known as my ‘teacher voice’. When I answered the phone, I not only stated the name of the salon, but my own as well, and would ask, “How may I help you?” Asking that particular question, rather than the usual, “May I help you,” required the caller to provide more information. Asking questions that evoke a simple ‘yes’ or ‘no’ response will only lead us to ask more questions before we understand exactly what is desired. Asking questions shows a genuine interest that will lead to commitment. Ask the right questions to get the desired feedback. If you do not ask questions, you will never know what the clients’ true desires and expectations are. She wants her nails done, that’s why she came to you – but what exactly does she want you to do? Does she want a simple manicure, or can you see that she needs a more complete service? Does she want nail enhancements? She may want her nails longer for a special occasion and does not intend to return for maintenance. She may not understand that you offer other services that are more temporary and less invasive to the nail plate. She may have very weak nails that require strengthening. Though she may request a nail enhancement, you may feel she would benefit more from regular manicures and home care treatments. Make suggestions! Ask questions! Listen to their needs! Repeat the question in your own words, and then ask her if that is what she desires. If not, more discussion is necessary. Do not be guilty of ‘selective listening’ by hearing only the key phrase. A good listener is perceived as a good friend. Your client may have told you something about herself that may affect the success of the service, and you missed it because she was not given your full attention. How often do we talk, and not get the feedback we desire? How skillfully we make our desires known depends on how well we speak. The use of slang words, terms, or too many ‘empty’ words can lead to misunderstanding. Are you guilty of using the ‘ummm’ word too often? Using this word gives your mind the time it needs to organize thoughts. It can also make you appear not to be knowledgeable. To organize a thought, simply take a pause in speaking. By organizing your thoughts in this manner, your words will command more attention. Communication means that what you say is understood before you can receive an effective response. Listening is not only accomplished with the ears, it is also being aware of the non-verbal messages being sent to, and from, us through our body language. As effective communicators, we organize and make sense of what we hear before we can understand the ideas presented to us. We can evaluate and make a decision only after we have gathered all the important information. We ask questions! We also curb our need to speak only of ourselves, and allow our clients to speak. Controlling the conversation, giving out too much unsolicited personal information, or the use of ‘gutter words’ is a sure fire way to lose clients. Allow your client to speak without interruption. Process what she is telling you before you respond, and express genuine interest. Be open, sincere and helpful. A successful nail technician is approachable, energetic, personable, fun, excited, educated and motivated. She shares her knowledge and accomplishments with her clientele and fellow workers. This type of nail technician is usually a trendsetter in their local area. She is the first one to sign-up for continuing education and to offer her clients the newest products or try the newest techniques. Her success can be measured through the variety of services she performs, her skill at performing them, her product sales and her consumer relation’s techniques. She knows that customer feedback is crucial to her success. There is something to be said for etiquette, even in business. Though the advice of Emily Post may seem to be a bit old-fashioned, etiquette is still a rewarded and accomplished trait. Our parents, or our grandparents, may have taught us the Golden Rule: Do unto others, as you would have them do unto you. This means that if you treat others with respect and dignity, you will receive the same in return. Likewise, if you treat them poorly, you will in turn receive poor treatment. Everyone is entitled to personal thoughts and opinions. We are not duty bound to change an opinion to match our own. We should only attempt to educate our clients on subjects related to the business at hand – and that is Nails! Many of my clients (after 10 or 15 years) became good friends. We visited in each other’s home, and enjoyed sharing weddings, birthdays, special occasions, and sorrows. We lived in each other’s lives on a personal level. Before we could accomplish this level of friendship, we developed a solid business relationship. I never gave them a ‘free’ service, or discount, and they never expected one. (Though one Christmas, in with my newsletter, I included a special ‘Thank you’ card with a $5.00 discount off any service.) Before friendship can develop, one must build trust. Trust comes through honesty and shared goals. Your client comes to you expecting beautiful, long-lasting nail enhancements. She has seen your work, your advertisements, or was referred by a friend or business acquaintance. Her expectations are high. The success of the service depends not only on your skill level, but on your communication skills as well. Listen to what she is saying. Digest the information, than make suggestions. Do not leave yourself open to failure by second-guessing, or selective listening. I know several very talented nail technicians who have been performing services for an average of 5 years, yet they are still attempting to build a clientele. They have a good command of language, are highly skilled and artistic craftsperson’s, and yet their business is not successful. Why? They have not learned effective listening or communication skills. Every one of their clients leaves the salon with the same application; nail length and type of service. In order to build a successful consumer relationship, we must first learn to listen, and then process the information before diagnosing their nail needs and prescribing the proper service. Know your products! When the client asks for an explanation of the service in order to improve her understanding, keep it simple. There is no need to go into a long lecture, or to attempt to educate the client in one sitting. Impress her with short; simple to understand terms, service descriptions, and home care maintenance information. Should the client desire to know more, an in-depth explanation may be given while performing the service. Educating your client on nail enhancements and home care will not send her off to her favorite supply outlet to purchase the needed supplies to perform her own nail service. Educating the client will increase trust, respect, and create a long-term relationship. Suggest what they need for home care, walk with them to the retail area, show them the items, and close the sale. Suggest she pre-book the next appointment in order to guarantee a convenient time for her schedule. If you do not already have one, design a ‘Client Consultation’ form. Write down any questions you feel are pertinent to the success of the service. Use this form as a reference guide at every visit, and keep the information current. You may use it as a guideline to design and personalize one that best suit your needs. Let’s take an objective walk through your salon. Look at the salon and get a feel for the atmosphere – the clients experience what you see and feel as well. Is the radio blaring, is the TV on, is everyone talking at the same time? Is the reception area open and inviting, stocked with current magazines, and contain a neatly stocked retail area? Is the reception desk easily accessible, and is the receptionist wearing a smile? Is the furniture arranged neatly, and does it allow for ample space around each station? These are a few of the questions I asked myself when I interviewed at a salon in which I eventually worked. When I walked in the door, I encountered a shelving unit immediately to my right, and chairs to my left, crowding the entrance. The space between the shelving unit and the reception desk, which led to the styling area, was no more than 3 feet wide. I felt I was not allowed into the main area of the salon without being invited. The main area was cluttered with too many chairs, tables and accessories. The stations were mere inches apart. There seemed to be no design concept, just a bunch of ‘stuff’ set around in every available space. Supplies that had just been purchased were sitting in boxes by the front desk, which was cluttered with papers. The employees were forced to hunt for needed supplies because there was no system for tracking or storing inventory. The owner of the salon was cheerful, inviting, and open to suggestions to improve her salon look. Making a few simple changes can drastically improve the salon, giving it a whole new atmosphere. Rearrange the furnishings to ‘open up’ the salon, giving it a more inviting feel. Remove or discard excess clutter and items that are no longer used. Keep stations clear of clutter. Paint or paper the walls in relaxing tones. Utilize attention-grabbing displays in the retail area. Store extra supplies in functional cabinets near your work area, or in the dispensary. Is your target clientele young, or established professionals? Consider installing a fax machine, or extra outlets for their laptops. This will let them know that you appreciate their time, and value their position. Subscribe to newspapers and magazines that will interest your target clientele. If they are mothers with young children, teenagers, young or established professionals, or sports enthusiasts, make sure you have periodicals that meet these interests. What type of image do you wish to portray to your potential clients with your business materials? These materials would include brochures, postcards, flyers, letterhead and business cards. Are your business cards white with traditional black print, or are they an eye-catching design? Is your salon menu printed on plain paper, or is it a professionally designed brochure? Does all of your business material project your salon image? There are several ways to develop and design business materials. Having them professionally designed and printed should be figured into your overhead expenses. Depending on the amount of materials you wish to distribute, and the type of copy, type of paper, etc., this avenue could be quite costly — Especially for the technician that is an independent contractor. For those technicians that would prefer to design and print their own materials, there are a great many desktop publishing programs available through office supply stores, and over the Internet. Some of these software companies also offer a variety of papers in many different styles to meet any need. Remember, you want your salon image to be immediately recognizable, so be consistent. Make your salon a reflection of who you are — Dare to be different! Before you spend big bucks on a newspaper advertisement that will reach the entire city, you must first decide on an advertising budget and in which area your ad will be most effective. An Industry report shows that the average cost of advertising not exceed 3 – 5% of your gross income. This percentage should be figured into your overhead, while allowing 7.5% for rent, 7-8% for supplies, 7% for all utilities, 5-6% for all taxes, 2% to bookkeeping 2-3% for insurance, 3-4% for depreciation, and your percentage for payroll. Once you have determined your advertising budget, you will need to determine the best type of advertising campaign to suit your needs. Are you looking for prospective clients, or do you wish to encourage your existing clients to try new services, or to use your services more often? Lets look at a few of the available options. A newspaper ad can run from one day to five, include the weekend (or not), and is very expensive. Everyone in the city, rather than the intended ‘target area’ will also see it. You will need to find out which newspapers or magazines distribute only in your area – a 3 to 5 mile radius. Ask that a representative visit you at your salon to help you develop an advertising campaign. Having them visit your salon, will give them a definite idea of your image. You will need to tell them how much advertising money is available for the year. They can then help you determine the advertisement type, size, and design. To keep your salon name and image in view, I found it profitable to run an ad once per quarter. I also found it profitable to advertise in the area business magazine vs. the weekly newspaper, because the majority of people keep a magazine for several weeks or months – especially if the ads feature ‘dollars off’ for first time clients or for special events. According to Lee Hartman of The Herald Coaster, the majority of newspapers are more widely read on Wednesday and Friday, than any other day of the week. Planning to have your ad run on one of these days will give it more visibility. Many businesses favor the use of direct mail, whether it is flyers, newsletters or postcards. For a nominal cost per postcard, this is one of the least expensive ways to get your message to existing and prospective customers. Mailing direct to existing customers can increase the amount your clients spend and the frequency of their visits. Existing clients can be encouraged to spend more by offering a ‘free gift’ or discount with a service. You may wish to introduce a new service, a new technician, or to announce a price increase. Special event or holiday promotions can be announced this way as well. A newsletter can not only introduce your salon to prospective customers, but will keep your existing clients informed of any changes you have made since their last visit. Some businesses choose to participate in the ‘coupon packet’ approach to advertising, although reports show that the majority of these coupons go immediately into the trashcan. Many businesses use postcards as ‘reminders’. I always get one from my Vet, Optometrist, Dentist and my G.Y.N, when it is time for checkups. I would never remember otherwise. You can try this same approach with clients. A reminder that it has been ‘2 months since your last pedicure,’ may prompt the call for an appointment. Whatever the good news, or current promotion, let your clients and prospective clients know – put it in writing. Another profitable (and free) form of advertisement is to associate yourself with a Dermatologist in your area that is knowledgeable in nail diseases and disorders. Write them a letter outlining your reasons for the association, and include brochures and business cards. Back up this letter with an invitation to visit your salon, or make an appointment for a business meeting. Tell them of your interest in exchanging referrals for clients in need of specialized services. For instance, you may have a client with severe ingrown toenails and they may have a client that cannot bend over to cut their toenails. In this case, you both would profit from the exchange of clients. You would maintain your original client for monthly pedicures, and add the referred client as a ‘regular’. Remember, one satisfied client will tell 10 of their friends! Is your salon located close to a Hotel or Motel? Visit with the manager, offer a brochure, and outline your salon services and your intentions. Explain that your salon is located within a certain distance should any of their guests inquire about the location of a salon. Ask if you may leave some brochures at the front desk. If the answer is positive, be sure to bring your own brochure holder. Your brochures may be discarded if they are left ‘loose’ on the desk and cause clutter. You might consider offering ‘dollars off’ coupons to the hotel staff for their referrals, or to the guests themselves. You can try this same approach with a variety of businesses in your area. They display your brochures, and you display theirs. Just be sure you have space for these brochures. Office supply houses carry a variety of display holders (wall mounted and free-standing) with up to 8 pockets that will hold 25 brochures in each pocket. Do you wish to reach the High School crowd? Contact the school in your area to discuss advertising in their yearbook, and their homecoming booklet. Introduce yourself to the school administration; leave a business card, service menu and brochures. Pick up a school calendar before you leave. Ask what the school colors are, and if school logo merchandise is available. You might also ask for student volunteers to be models for your print layout. Become involved with school programs through career days, school clubs, or home economics and health classes. Create special offerings for students, and stay on top of teen trends. My least favorite form of advertisement is the ‘flyer’. When I come out of a store and find one on my windshield, I usually throw it on the ground without looking. I rarely ever look at the ones attached to my doorknob with a rubber band either – they go in the trash immediately. I do, however, have friends for whom this approach has worked well. 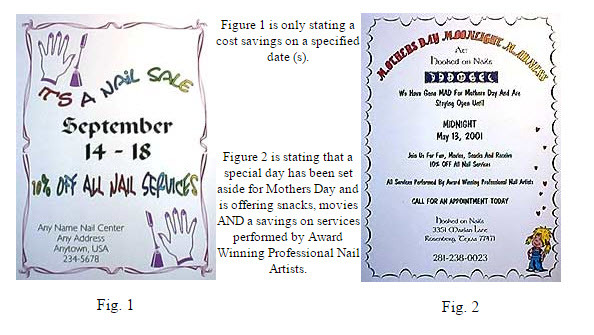 The advertisements were impeccably designed, executed, and targeted for a special event such as Mother’s Day, Valentines Day, or another special holiday. You will need to determine where your flyer is best placed to ensure the greatest success. My suggestion is to designate a ‘target area’, then distribute the flyers in a different area each month. Distributing them in this manner will allow you to track the amount of new clients generated in each area. Since the majority of mailboxes are required to be at the front curb of each home, the homeowner usually needs to go get it. Whenever I find a flyer tucked between the mailbox and the flag, I will usually read it while walking back to my house. I must tell you that I have a very long driveway, so I can read several flyers before going inside and deciding what to do with them. This is how I chose the water company that delivers to my home. Why does one ad increase appointments while others fail? Successful print ads contain certain characteristics that, if used well, will grab the consumer’s attention. Less than 30% of readers will notice any given advertisement. Less than 10% will read more than half. Therefore, it is vital that every element of your ad grab and hold attention. You may already have an established salon image, though if not, you should. The ‘core message’ of your ad should reflect this image. A strong salon image will stick in the client’s mind. Is your service quality better than that of your competitors? Have you won any awards or honors? Are your everyday prices lower than those of other salons? Do you specialize in a certain service? Do you treat clients like family? What is it about you or your salon that attracted your existing clientele? If you do not already have a salon image, and don’t know where to start, ask your clients a few key questions. What is it they like most about the salon or the services? Clients are always willing to tell you what they think. You might even make up a questionnaire for them to fill out, and involve them in helping you to design your new ‘image’. What idea do you want people to walk away with after they read your ad? What idea or image have your current ads been sending? Is it the message you want to express to existing or prospective clients? Look at the ads of your competitors. What idea do they express? If they are advertising price, you may want to emphasize quality, or specialized services. Using this message in all your advertisements will help the reader to remember your business. You also have to deliver your message fast, or they will lose interest. You have about 3 seconds for your ad to be noticed before the reader flips the page. Is the headline an attention grabber? Is it simple? Does it get your message across? The reader needs some reason to keep from turning the page. “Mother’s Day Special” is simple, but it’s boring. “Mother’s Day Moonlight Madness” sounds more exciting and will gain more attention. Using your name as a headline, or the salon name, only tells them who you are, not what you can do for them. Get their attention by stating a benefit. Being a success takes careful planning. You can be a top award-winning tech, but if your salon is not easily assessable, has inadequate parking, is far from a business district, or receives little community awareness, your business will probably suffer. By working with a plan, it is easier to step into the role of salon owner, independent contractor, or successful employee. Have you just received your license, or are you looking to relocate to a new salon? If you are a new tech, seeking out salons that offer a mentoring program and/or continuing education for new employees might be high on your list of prospective employers. This type of salon is highly aware of their image, and eager to train a potential employee to join their team. A nail tech that is a good team player will work for the welfare of the salon, rather than independently, and is a valued asset. Are you looking to relocate? Do you have an established loyal clientele that is also willing to relocate? Are you thinking only of yourself in the move, or considering the benefit to your clients as well? A successful listener will know which benefits interest her clients, and these desired benefits should be placed on your list as well. List the salons in your area that interest you, and visit them before you make an appointment for an interview. Making these visits will allow you to witness the everyday workings of the salon. If you are uncomfortable with the idea of a ‘cold’ visit, make an appointment for a simple manicure or polish change. Present a professional image at this appointment, keeping in mind that someone will remember you on your next visit. Watch how the employees interact, observe the owner, receptionist and the clientele. Do they appear happy, knowledgeable, skilled and articulate? How many of the important issues on your list will be met at this location? Observe, listen, and then make notes after you leave. After visiting the potential salons, review your notes, and then call the salon that best suits your needs for an interview. Remember that you have only 60 seconds to make a positive impression, whether on the phone, or in person. Dress for success, and wear a perfect set of nails. Be prepared to perform a nail application as part of your interview. Present your resume, communicate your desires and needs in a positive light, and if relocating from another salon, never say anything derogatory about your previous employer or salon. Ever! Gossip about past salons, employers or employees will only make you look bad, and may cost you a desirable position. While location, educational opportunities, available clientele and salary or commission is an important issue when starting out, one must still set goals. What do you hope to accomplish in the first 6 months of employment, the first year, five years, or ten years? Write down these goals and keep abreast of your deadline. Devote yourself to reaching one goal at a time. Trying to attain too many goals at once is not only frustrating, but it can destroy your well-developed plan, leaving you open to failure. If planning to open your own salon, you must be education and marketing driven, while developing a unique level of customer service techniques that will set your salon above others in your chosen area. Keeping abreast of current trends, new product developments, and new technology will help you to become a trendsetter. Seek the advice of industry consultants and marketing specialists to aid you in the development of your business. One cannot just open up a salon on an available corner and be successful. It takes a carefully designed, creative, specific long-term plan. Define your objectives and plan a strategy to reach them. Your objectives are your goals. Your strategy is a map to help you reach your goals. This technique will also work should you be seeking an employment position with a salon or as an educator. When it comes to cost for opening your own salon, how much is too much for you? Are you planning to reach your goal within 6 months, or have you given yourself a more realistic goal? Can you purchase all the equipment and supplies you need immediately, or have you given yourself room to grow? Have you canvassed your target area for cost per square foot, build out costs, etc.? The planning stage is where you will need to project all build out costs, equipment, supplies, furnishings, advertisement, computer purchases, plus employee salaries, commissions and benefits. Covering all your bases before you ‘dive right in’, will give you an idea of your total start up costs. You will then need to determine how much revenue the salon will need to generate to order to cover your monthly overhead and employee commissions. Many salons and independent contractors hesitate to raise prices. They are concerned that when an increase is implemented, clients will leave, and in some instances this statement will apply. You have already figured an initial service charge that will allow you to meet your goals. You must not forget future goals; supply cost increases, education expenses, and other overhead cost increases. Review your overhead expenses twice per year. Performing a review will allow you to see which expenses have increased and which ones have remained the same. Have you discovered that certain service products increased beyond a comfortable level while others have remained the same? The services whose products have dramatically increased in cost designate a price increase. For instance, have you purchased a more expensive manicure or pedicure system, and still charging the same price? Project additional increases for these services, and then raise the price of that service to cover future costs and raise your profit level, while retaining satisfied customers. Still hesitant about raising your prices because you are afraid of losing clients or revenue? Consider that you are booked solid; no time for yourself or your family, no time to fit in repairs, or you have increased your hours in order to earn more money. It is great that you are in such demand, however; unless you plan your work hours to include breaks, you may be headed for burnout due to over-extending yourself. How can you allow yourself more time without sacrificing income? Lets say that during a 40-hour week, you service one client per hour, and charge $25.00 for a fill. Your gross would be $1000 for that week. Raising your price 15% would allow you to earn an additional $150.00 a week. Now, you could afford to loose 6 clients, and free up some time while maintaining your weekly income. You can utilize this extra time to send thank you notes to new clients, order supplies, eat lunch, or to service emergency clients. Another simple guideline in raising prices is to determine how many of your available appointments are consistently booked. To figure your percentage of booked appointments, you need to determine how many appointment hours are available per week. To find this figure, divide the number of filled appointments by the number of available hours. If the number is higher then 85%, you should raise your prices. This is the level at which appointment problems arise; you are unable to service clients for repairs, to change their appointment times, take periodic breaks, and make or return phone calls. What if the level reaches 85% again? It’s time to raise your prices! This is how I arrived at my charge of $80.00 for a full set, and $45.00 for a fill, while my ‘competition’ down the street was still charging $25.00 for a full set, and $12.50 for a fill. Many nail technicians and salon owners fear raising their prices because the competition down the street charges far less for their services. Does the competition perform at your same level of expertise? Are they using the same product system available in your salon? Are they practicing high levels of sanitation? Have they participated in continuing education, won awards, or specialize in certain services? Another thing to take into consideration when raising your prices is to ask yourself the question, “Are my clients coming to me because of my low prices, or because they receive excellent service at a reasonable cost?” Over the years I have come to realize that consumers can be placed into two main categories: Those that strictly price shop, and those that value shop for quality. The second group will determine if the quality they receive is worth the value of any given item or service. However, In order to justify your service charges, you must maintain your high level of skill and professionalism. 20% of consumers seek information in answer to their concerns. They listen for power words, such as: New, Improved or Revolutionary. 10% seek simplicity and ease. They want to reduce complexity in their lives. 10% are warranty seekers, wanting a promise with a condition. 50% of consumers like to experiment. 20% are confident that they are worth the amount they spend. The information seeker desires education on a product or service before making a decision. With this type of client, you will need to be knowledgeable of your product, and secure in your abilities. He or she will ask the most questions, demanding all the details. Those clients that look for something easy do not accept any breakdown in service or product. They do not want to spend extra time in the salon getting repairs. To satisfy this client, increase your expertise in nail preparation and product application techniques to prevent problems from arising. The consumer that enjoys experimenting will be the first one to try any new service or technique you have to offer. Are you considering adding airbrushing to your service menu? Introduce the new service to this type of client. They are quick to try something new because they hate routine, and being bored. This type of consumer is also in the group that believes they are worth the price of the service. The warranty seeker is looking for a guarantee – a promise with a condition. She may say, “I will try it, if you – – -.” You are courting disaster if you guarantee this type of client. She is normally a selective listener who changes the subject after she has heard the key phrase. She gestures a lot, and is constantly moving. She may also be the one who wasn’t doing a thing when one of her nails just fell off! Although this type of client is the most difficult, she will become an ally through education. Always involve the client in the decision making process in order to reach a solution that will best suit her needs. Don’t wait for your client to ask for suggestions. It is a vital part of the success of the service, to suggest and sell home care items. If you lack sales training, or are reluctant to introduce something new, try the ‘soft sell’ approach. Introduce new products or services with ‘tent cards’ placed at your station, the front desk, and the retail area. Introduce this new service in your salon newsletter or on reminder cards. Use the new product during the service, explaining the features and benefits. Clients are more apt to purchase retail items if they understand that the item will fill a particular need. For instance, a natural nail client that experiences polish chipping after a few days would benefit from purchasing nail and cuticle oil. The client with dry cuticles would experience the benefit of re-hydrated cuticles while reducing the chance of tearing. I enjoyed combining several different retail items into ‘home care packages’. The smallest of these retail packages contained a 3-way buffer, a 240-grit file, a 360-grit buffer, and a ¼ oz. bottle of nail and cuticle oil. On the client’s first visit to the salon, I would include this basic package with a full set of nail enhancements. To order to include the package, I raised my full set price to cover the cost of these items. I explained the benefits, and how to use them. I never failed to have the client as a return retail customer. These home care packages can include any item relevant to the success of the service rendered. They can also be retailed as gift packages during holidays or for special occasions, and may include a sample size base coat, enamel, topcoat, or treatment. When you have increased your service menu to include aromatherapy massage, paraffin, or spa-type services, airbrushing, nail art, or any other new service, it becomes an add-on service opportunity. Place new service items close to, or on, your table so they are highly visible. Clients are very observant and will notice anything new. When they ask, “What’s this?” it is the perfect opportunity to introduce the new item, state the features and benefits, and close the sale. If you have added nail art to your menu, wearing a simple design on one or two nails will raise curiosity, and give you the opportunity for an add-on service. An add-on service will increase your profits with very little effort on your part. All you have to do is peek the client’s curiosity. Change the content or position of retail items frequently. What a client may not see at one height, she may notice at another. You might also take a cue from the restaurant industry by putting an easel in the reception area that lists your new services or retail items. Create eye-catching displays throughout the salon. A client is someone who seeks only services, a customer is someone who seeks services, and purchases retail. You will increase your profits by turning clients into customers. Qualify yourself, qualify your product choice, qualify your experience, and always use your best judgment. In my 32 years in this industry, I have been both an employee and an independent contractor. There are certain benefits to being either one. As an independent contractor, I enjoyed having the opportunity of setting my own business days, hours of operation, service menu and costs of service. I was also responsible for the success of the service, greeting clients, booking my own appointments, paying my own taxes, supplying insurance, advertising, and all other business related costs. I had to follow all the rules and regulations as set forth by the Cosmetology Commission, and the I. R. S. In other words, an independent contractor is a one-person salon within the confines of an established salon. With a busy career as an educator for a major manufacturer, the independent contractor status suited my schedule, while allowing me to plan personal time as well. During the busy Trade Show season, I could easily rearrange my salon schedule to accommodate the required Saturday show set-up. I was my own ‘boss’ with all the responsibilities attached to the position. Check with your state board prior to operating as an independent contractor. Most states require an Independent Contractor license in addition to your manicuring license. Should you decide all that bookkeeping or responsibility is not for you, then the position of employee may better suit your needs. This is how I began my career. I could devote time to perfecting my technique, customer relations and communication skills, continuing education, and still spend time with my family. I learned everything I could from my employers – from successful promotions, business plans and strategies, to the ideas that ultimately failed. Beginning your career as an employee will allow you ample opportunity to learn and grow before you take the giant step to independence. Most veteran nail technicians are eager to play the part of mentor. As a salon employee, you are required to follow the salon rules and regulations. You may be asked to play several different roles in addition to manicuring: Greeting clients, booking appointments, helping fellow team members, or stocking inventory. You may be required to perform only manicures and pedicures until your skill level increases. Don’t despair! Take advantage of every opportunity to perfect your skills. With every skill you conquer, there is another one to learn. As an employee, the salon owner is required to withhold income taxes, withhold and pay social security and Medicare taxes, and pay unemployment tax on wages paid to you. An employer is also required to provide insurance coverage through the Workers Compensation Commission should you experience an injury in the workplace. As an employee, the salon owner may offer to place you on straight commission, weekly salary, or offer a salary + commission, or a sliding commission pay scale. Lets examine the earning potential of each of these pay scales. Straight Commission: A percentage of gross sales from service procedures. You may receive a commission rate of 40% up to 60%, with the national average being 50%. Sliding Scale: A percentage of the gross sales from services dollars. The higher your gross receipts, the higher your percentage of commission. For instance, if you sell $400.00 in services per week, your percentage is figured on 40%. Sales of $600.00 per week, or higher, would be figured at 60%. The commission percentage would vary from week to week, depending on your gross sales. Weekly Salary: Your weekly salary is generally figured by determining your skill level and current client listing. The least amount you can be paid is current minimum wage. Salary + Commission: In this category, you are usually offered minimum wage, plus a commission on gross sales. In order to reach the commission status, you must generate enough gross sales to match your salary amount. After this amount is reached, you will receive a commission percentage on the additional sales. Figuring the minimum wage on the current amount of $5.15 per hour, you would need to generate gross sales of $206.00 for a 40- hour workweek. Any sales over that amount would be paid as commission. In other words, you will need to earn your salary before a commission is paid. These rates only serve to give you an idea of the various pay scales, and are not implied to be industry standard. Each salon owner calculates employee pay according to salon overhead, earning potential based on available salon appointment hours and technical skill level. According to an industry survey conducted by Nails Magazine for the 1999 Fact Book, 27.2% of nail technicians are employees, earning an average of $469.24, including tips, and working 44.6 hours per week. Total service income for 1998 was up 2.4% over 1997. The number of licensed nail technicians has risen by 12,356 since 1998. 29.7% of nail technicians are booth renters, with 96.8% purchasing their own products and spending an average of $150.22 per month on supplies. The national average for booth rental fees is $262.52 per week. For further information, the Nails Magazine Fact Book is available the first of every year, and is a complimentary addition to the yearly subscription. You may contact them at: www.nailsmag.com. According to the Internal Revenue Service, employee status is determined by Common Law Factors. We have heard a lot about a list of 20 factors that the IRS uses to determine employee/independent contractor status. According to the regulations I found on the government Internet site, www.irs.ustreas.gov, Market Segment Specialization Program (MSSP), Beauty and Barber Shops, it states: “The question of whether an individual is an independent contractor or an employee is one fact to be determined upon consideration of the facts and application of the law and regulations in one particular case. As an employer, anyone who performs services for you is your employee if you can control what will be done and how it will be done. This is so even when you give the employee freedom of action. What matters is that you have the right to control the details of how the services are performed.” Never take for granted that acquiring an independent contractors license is all you need to go into business for yourself. It would be advisable to search the government Internet site and look for current information. Ask the employer how much control she plans to have over your activities. It may also be advisable to have a lawyer familiar with these laws to draw up a contract between the salon owner and yourself, covering these vital issues. Whether an employee, independent contractor, or employer, it is important that the salon atmosphere reflect team effort. If you wear too many hats, your business will suffer and you will experience mediocre results. A salon owner that also works behind the table cannot afford to lose clients because she is also responsible for the telephone, booking appointments, paying vendors, etc. Building a strong team involves providing leadership, designating responsibility to the staff, setting goals, and working with the team to achieve those goals. Setting policies and procedures are the guidelines that help you and your staff grow. Set an example by following your own guidelines. Many salon owners have failed to set an example for their employees by showing up late, while lecturing their employees on the importance of being on time. A well-trained, personable, receptionist that understands time management, service descriptions and menu pricing is of key importance to the team. The receptionist is of vital importance in client relations, and in keeping the salon running smoothly. According to my clients, the most irritating service interruption was my having to leave the table to make an appointment – even though we had a receptionist. The second was for the receptionist to ask me if I could take an appointment or join our conversation with unsolicited advice, or to share her own thoughts, ideas, or needs. The third was to hear my fellow employees talking about another client. It made them wonder what was being said about them after they left the salon. My personal opinion on gossip? Never tell anyone anything you would not want to see on the evening news! Part of the clients first impression of you or your salon, is how well the employees interact with each other. If there is one employee, or staff member, that consistently criticizes everything and everyone, it can create an undesirable atmosphere. Teamwork is the heart of the salon. It makes the client willing to return and creates a positive atmosphere for employees and clients alike. A team player is always willing to mentor to his or her fellow employees, and to share new ideas or techniques. A team player does not have to be asked for help, but will offer it freely. The clientele, who in turn will respond with a positive attitude, notices this type of attitude. The salon with a positive attitude and friendly atmosphere will be awarded success. Many salon owners seek out employees that are high-performers, thinking that if they just turn them loose, they will be successful. In reality, many salons fail because of this thinking. A good team is more powerful and more successful than the individual because they are all working together to reach a common goal. If the salon is successful, they are successful. A nail technician that is fortunate enough to work for a salon owner or manager with an intuitive managerial style will not only be successful, but will grow faster in his or her field of expertise. This type of owner/manager will insure that all employees are not only technically trained, but trained in communication and business skills as well. The intuitive owner/manager realizes that teamwork cannot be developed or implemented overnight, but takes concentrated effort to develop and maintain. Setting team goals is a joint accomplishment, builds confidence, and assures individual and team success. One ‘grouchy’ member can destroy the morale and atmosphere of a salon, however; if the employees and manager are truly a team, they will work together to bring this employee back on track.